Static provider returns 10 years (approximately 2500+ bars) of daily (EOD) historical data. Streaming provider supports Wealth-Lab's Paper Trading feature for U.S. market only. The "Nasdaq Nordic" provider does not support paper trading. When "Always return data with partial bar" is enabled on provider's Data Manager tab, static data (for Nordic stocks only) will include the current day's partial bar, and the last bar will be corrected on each update. 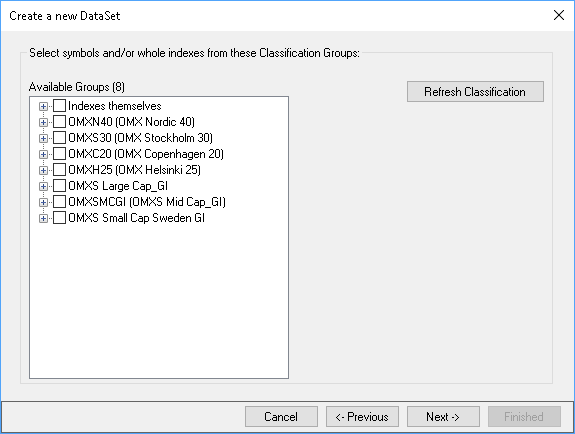 Users can choose symbols or entire indices from Classification Groups by selecting "Nasdaq Nordic" in the New DataSet Wizard. Your suggestions for inclusion of new indices to the Classification Groups are welcome. While entering symbols manually will not be supported in the Nasdaq Nordic provider, to quickly view a Nordic symbol's data on demand, simply add its instrument code (e.g. SSE3966) the usual way using the "primary" Nasdaq provider's (for U.S. stocks) New DataSet Wizard dialog. The Nasdaq U.S. provider supports two available items: short interest and dividends. The short interest data is available on a bi-weekly basis for NASDAQ stocks only (not for NYSE and AMEX stocks). Provider returns extended dividend data going back to 2000 (for NASDAQ stocks; for others from 2013 only): date, dividend type, cash amount, declaration, record and payable dates. Each dividend item comes with these extra details attached: ExDate, Type, CashAmount, DeclarationDate, RecordDate, and PaymentDate. Make sure you've collected the fundamental data before running this Strategy (Data Manager > "Update Data" tab > check "Nasdaq fundamental data" > go to "DataSets" tab > click "Update DataSet"). Provider does not have the means to adjust for splits and dividends. To maintain your data in good shape, either perform splits manually or reload the DataSet from scratch using the Data Tool's "Remove all data" feature and then updating the DataSet. Paper Trading and fundamental data are not supported by Nasdaq OMX Nordic Streaming provider. Short interest for NYSE and AMEX stocks is not supported by Nasdaq fundamental provider.